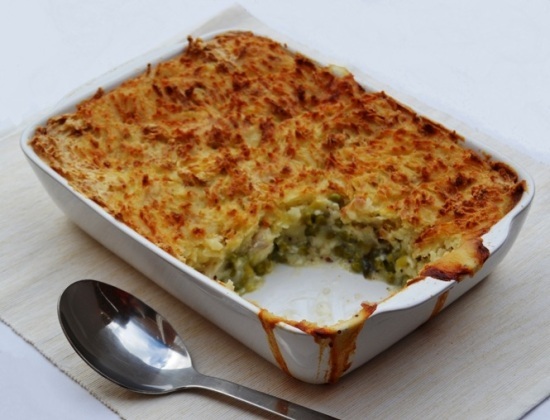 Bags of frozen, boneless, skinless cod fillets are inexpensive, easy to prepare and perfect for this easy fish pie which is simple to make and great for batch cooking. A tub of crème fraîche flavoured with dill, garlic and mustard makes a quick creamy sauce. This easy fish pie is topped with mashed potatoes. I don't bother peeling my spuds, I just wash them and dice them. Not only does it save time, all the vitamins are in the potato skin so it's better for you too. Start by preparing the mashed potato topping. Place the potatoes in a large pan of salted water. Bring to the boil and simmer for about 15 minutes until tender. While the potatoes are boiling, put the frozen fish in a large frying pan and pour over enough milk or water to just to cover it. Season with salt & pepper and add bay leaves. Poach the fish over a low heat for 10 – 12 minutes until just cooked through. When the fish is cooked, transfer to and over-proof dish using a slotted spoon. Break the fillets into bite size pieces and spread evenly over the bottom of the dish. Rinse the pan from the fish and fry the leeks in a little oil for 3 minutes until just soft. Add the peas, crème fraîche, dill, crushed garlic and mustard. Season to taste, stir well and cook on a low heat for about 2 – 3 minutes until heated through. Spoon evenly over the fish. By this time the potatoes should be cooked. Drain and mash them with the butter and enough milk to give them a nice smooth & creamy consistency. Season to taste. Spread the mashed potato over the fish pie filling evenly and use a fork to fluff up the surface. Top with grated cheese if you like and bake in the oven for about 30 - 40 minutes, until golden and the sauce bubbles around the edges of the potato in the dish.